Alexander Lukashenko's victory in the presidential elections in Belarus came as no surprise to opposition supporters or Western observers. Since sweeping to power 12 years ago, he has consolidated his hold on the former Soviet republic. His methods have brought criticism from the West - particularly the US Bush administration, which has described him as the "last dictator in Europe" at the head of an "outpost of tyranny". Mr Lukashenko was able to seek re-election for an unprecedented third term thanks to a controversial referendum in 2004 that abolished the constitution's two-term presidential limit. Human rights campaigners and Western governments complain that opposition voices are harassed and stifled and independent media has been all but eliminated. Opposition activists are closely monitored by the secret police - still called the KGB. However, the president does enjoy the support of many Belarussians for maintaining political and economic stability - a campaign slogan in 2006. In a land which lost one-third of its population in World War II, most people fear instability and the prospect of civil war far more than they fear their president. That makes the kind of popular uprising seen in Georgia and Ukraine unlikely in Belarus. Although Mr Lukashenko now appears firmly ensconced at the heart of the country's Soviet-style establishment, a look at his early life reveals rather humbler origins. Brought up by a single mother in a poor village in eastern Belarus, he first made his mark as the manager of a collective farm in the late 1980s. Moving into politics at the end of the decade, he quickly established his reputation as an outspoken man with firmly authoritarian instincts. In August 1991, as a member of the Belarussian parliament, he declared his support for the attempted coup by hardliners against Soviet leader Mikhail Gorbachev. The image has stuck ever since, and it is one he is perfectly happy to defend. "An authoritarian style of rule is characteristic of me, and I have always admitted it," he said in August 2003. "You need to control the country, and the main thing is not to ruin people's lives." Mr Lukashenko's early years in power demonstrated his commitment to this belief. In 1996, he disbanded parliament, which had been seeking to impeach him, and also strengthened his control over the judiciary. The new parliament which emerged was hand-picked, and subsequent elections to its successor in 2000 were widely condemned. Meanwhile, many former allies and government ministers have either fled abroad or joined the opposition. Others, such as former Deputy Prime Minister Viktar Hanchar and former Minister of Internal Affairs Yuryy Zakharanka, have simply disappeared. It is an approach to power which has won Mr Lukashenko few friends. Russia remains Belarus' chief ally. Moscow offers support with cheap energy supplies and Russian observers said they saw little wrong with the 2006 vote. The two countries are also in continuing talks on forming a "union state". 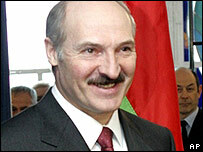 Mr Lukashenko appears undeterred by criticism, whether it be from home or abroad. "I've been hearing these accusations for over 10 years and we got used to it," he said before polling. "We are not going to answer them. I want to come from the premise that the elections in Belarus are held for ourselves. I am sure that it is the Belarus people who are the masters in our state." He warned that anyone joining an opposition protest would be treated as a "terrorist", adding: "We will wring their necks, as one might a duck".